Nico Rosberg on the podium. German Nico Rosberg steered clear of the chaos unfolding behind him to cruise to an unchallenged victory in a disrupted Belgian Grand Prix yesterday. His Mercedes teammate Lewis Hamilton, the world championship leader, finished third from the back row of the grid, behind Red Bull's Daniel Ricciardo. "It's been a great weekend, very, very happy with that result," Rosberg said after his 20th career win. "Congrats to Lewis, last place to third must be pretty impressive." The pole-sitting Rosberg kept the lead at the start and was never headed, after his main rivals, fellow front-row starter Max Verstappen and the Ferrari pair of Kimi Raikkonen and Sebastian Vettel, collided at the first corner. That elevated Ricciardo, starting fifth, to second and the Australian kept that place until the end, crossing the line 14.1 seconds behind the triumphant Rosberg at the Spa-Francorchamps circuit. 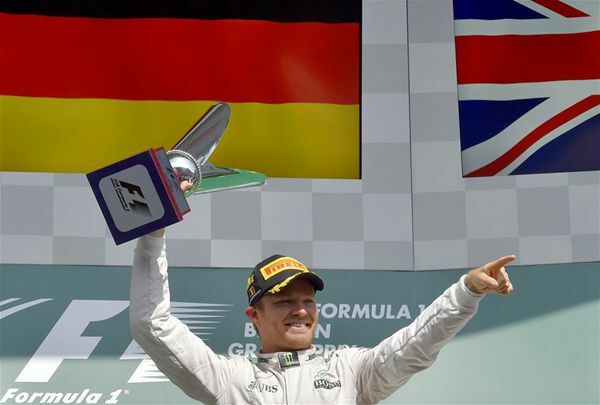 "Lewis wasn't out there to battle it out, so that made it an easier weekend," Rosberg said. "It all worked out fine." Red Bull's Verstappen was involved in a first-turn collision with Raikkonen and Vettel that shaped the race. It had a beneficial effect on Hamilton and McClaren's Alonso, who avoided the early carnage in front of them, then gained places when the safety car came out after Danish driver Kevin Magnussen's crash. The race was briefly halted with nine of the 44 laps completed after the crash for Magnussen, who lost control of his Renault as he crested the fearsome Eau Rouge. The Dane, who was taken to hospital for routine checks after suffering a small cut to his left ankle, slammed violently into the barriers. Officials deployed first the safety car then the red flag as marshals worked to repair the damage. Yesterday's win was Rosberg's sixth of the season, but first since June's European Grand Prix, and it cut the deficit to Hamilton to nine points in the standings. The Briton's rise through the order was helped by the first corner chaos and the subsequent Magnussen crash. Nevertheless, the triple champion, who had gone into the weekend gunning to become only the third driver to score 50 career wins, was happy to come away still ahead in the title race. Germany's Nico Hulkenberg finished fourth for Force India ahead of teammate Sergio Perez of Mexico, on a strong day for the Silverstone-based team that took it ahead of Williams into fourth in the constructors' standings. Vettel fought back to finish sixth ahead of Alonso with Raikkonen ninth and Verstappen a disappointing 11th. The race start was clean enough for Rosberg, but it was mayhem behind him. The 18-year-old Verstappen, the youngest driver to ever start on the front row, was overtaken by Raikkonen and Vettel, and then aggressively tried to go for the inside heading into the first turn — even though there was very little room. The impeded Ferraris were now squeezed wide and, as a consequence, Raikkonen came across and nudged into the side of Vettel. Verstappen blamed them, saying "they just turned into me" but the incident was the latest of several involving the Red Bull driver. Verstappen became the youngest driver to win a race when he clinched a brilliant victory at the Spanish GP in May. His talent is undoubted, but his aggression is not to everyone's liking. Later in the race, he again infuriated Raikkonen, a rare feat considering the Finn's nickname is "The Ice Man" for his usually unflappable demeanor. Raikkonen came in for a front nose change but the pit crew also had to put out a small fire under his car.